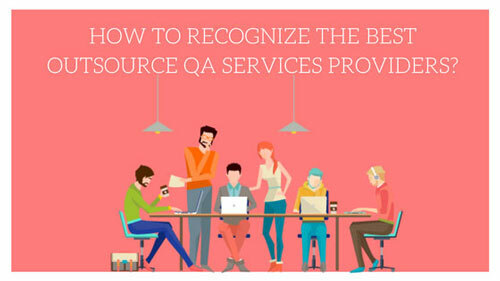 How to recognize the best outsource QA and Testing Services Providers? It is never easy to get any job done with an outsourcing partner. When you have to outsource QA or software testing services or app development services from vendors, you possibly spend more time while surveying the market and talking to the customers and competitors. It seems a normal homework for every business that wishes to outsource QA or Testing services from third party. But here, so many risks are involved to outsource Testing and QA work! Do you see any benefit in outsourcing services like QA and Software Testing ? Many businesses do reap benefits from outsourcing services. There are possibilities to get extremely experienced Software testers for QA. Unlike onshore or in-house services, outsourcing saves your money. It offers access to more tools and devices along with platforms that are unavailable in your in-house. It is a valuable thing because your products are analyzed by human eyes and not by computer. But if you fail to select the right outsourcing partner, you will encounter so many difficulties. You must associate with the Offshore Software Testing services vendor who can work as per your time zone. You may avail the lowest possible cost for the services while outsourcing services or solutions, but there will be misunderstandings and you have to deal with them anyway. There is a large supply of QA engineers and software tester, still getting the right one is a dream for majority of businesses. You should read the testimonials and feedback provided by the existing customers who have availed such services from your selected vendor. This will give you an idea about its quality services and customer relationship. If you need complete lifecycle of software testing and you have a limited budget and time, you should consider Software testing or QA outsourcing to a dedicated team of qualified QA engineers working in reputed company. Experienced professionals have acquired strong skills for software testing and have worked on countless projects for distinct businesses. What does good Software testing Services provider offer ? Through this test, they will check and analyze the SEO of your website. Mobile apps are tested across many permutations by QA engineers. Gaming and web apps are tested on several standards by QA engineers. It is a software testing method used by QA engineers to check the localized version of a product for particular locale settings. It is a hands-on approach made by testers that involves least planning and more test execution. Usability testing is a technique followed by engineers in user-centric interactive design to analyze and evaluate a product by testing it on users. It is a type of technique used by testers for testing the functionality or features of the system or software. It is a process of testing the system with each one of the supported hardware and software configurations. Acceptance testing is a level of the software testing in which engineers check the system for acceptability. Through this testing, QA engineers evaluate the compliance of the system with business requirements and check whether it is acceptable for delivery or not. It helps in determining if an information system protects data and sustains features as intended. Security testing also aims at checking six basic principles – Confidentiality, Integrity, Authentication, Availability, Authorization and Non-repudiation. It is a network performance testing process that is applied by engineers to measure the performance of a computer network qualitatively or quantitatively. •	They communicate – communication is a key. A face to face interaction is irreplaceable but there are some technologies leveraged by Software testers of modern era. They use IM services and video technologies for communication purposes in order to bring the distributed team together. •	They are aware of their responsibilities – It is the responsibility of the development team to verify testing. If the team performs verification testing, it will help them in saving time and do the job well. •	Continuous integration practice – When the team members integrate their work and integration is checked by the team, it results in a stable system. It also helps in recognizing integration problems on time. Experienced engineers use specialize tools like Jenkins to perform this practice. If you get a partner with all these traits, hire immediately and outsource testing services. There are only few QA services providers across the world meeting the standards and requirements of the customer. Once you connect to the reliable QA services provider, you don’t have to worry further. The Testing and QA engineers working with the provider will work on your project and deliver the best QA services. Like the post? Share your valuable comments and views with us and tell or readers about the idea of outsourcing QA or Testing services.